Metal Witch's second full length album is appropriately titled, Tales From The Underground, because that's where the band has been lingering about. 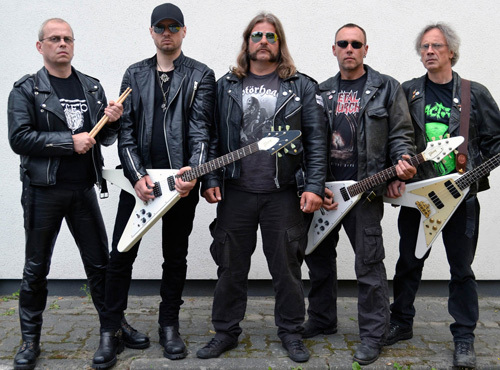 Begun in Germany in 1985, Metal Witch had a brief start of only two years. Yet ten years later the band would reunite and rise again and, in another ten years release their first full-length album, Risen From The Grave. To explain Metal Witch's sound is simple: this is traditional heavy metal, the German version of the New Wave of British Heavy Metal. It's got the essential elements of twin guitar riff harmony and leads, a galloping rhythm section when they need to get into their nascent speed/power metal mode, and gravel gruff, yet melodic, vocals. Actually, I suspect, when some readers listen to the video below, they may think Metal Witch is a copy or clone of some other German icon(s) Udo Dirkschneider or Accept. Why? It's the character and timbre of Kay Rogowski's voice in combination with the heavy metal. Yet he adds small, but curious, nuance to his style. At the start of Heavy and Roll, Rogowski likes to throw in a whistle, a "let's go whistle," much like Skynyrd's Ronnie Van Zant used to do. All in all, at first I found his vocal style kind of annoying. But then it took hold, thanks to the music. As for the songs themselves, Metal Witch has an impressive command of classic heavy metal. The twin guitars are substantial, the leads generous. And the band knows how fold a good rock groove into their heavy metal. All these things come through within Heavy And Roll, Stay True, and Still Going Strong. For pure speed metal, The Man Who Shouldn't Live and Weapons of the night roll along like a bullet train. Bottom line: for classic, keep it true, traditional heavy metal, Metal Witch delivers the goods with Tales From The Underground. Recommended. 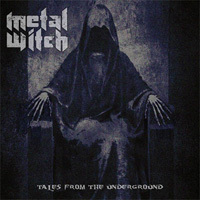 For classic, keep it true, traditional heavy metal, Metal Witch delivers the goods with Tales From The Underground. Recommended.